The isolated farmstead of Shillmoor stands where the delightful Usway Burn tumbles into the twisting River Coquet. Rising to the north-west, the mass of Shillhope Law dominates the lonely Upper Coquetdale farms of Barrowburn and Windyhaugh and a host of fine small green rounded hills. These are quiet hills where cleughs, burns, sikes, hopes and haughs abound and where views stretch out across a seemingly endless landscape towards the northern edge of England. This is a walk of ups and downs, of breezy summits and sheltered valleys. This is a walk to intoxicate. Drink on. 1. The village of Alwinton, home to the tiny Rose and Thistle public house, lies in the Cheviot foothills and is the last village in Coquetdale. The isolated farmstead of Shillmoor stands 3 miles further on along the unclassified, single track road in an area once colonised under the monasteries. There is roadside parking at Shillmoor beside the River Coquet immediately before the bridge (NT 884078). Whilst this area is now used as part of the Army`s dry training area there is no danger whatsoever, so start your day without any concern. Cross the bridge and turn right along the opposite bank of the river, past two houses on your left. Before reaching the buildings of Shillmoor turn first left along a slightly rising gravel track. The `Private Road` sign applies to vehicular traffic only so cross the cattle grid and within 100 metres take the rough track (NT 886078) which climbs away to your left alongside a stone wall. The track continues to rise close to the wall and then a fence. You will gain height quickly as the steepening track heads towards a gate just beyond the crags to your right. From here there are cracking views to the River Coquet and the neighbouring hills. You will certainly appreciate the breather. Once through the gate follow the grassy track along the ridge to the 436 metre top of Inner Hill (NT 877089). You are now caught between the narrow steep sided valley of the Usway Burn to the east and the wider Upper Coquetdale to the west. The near-vertical views down to the twisting Usway Burn and a series of interlocking shanks is particularly eye-watering. 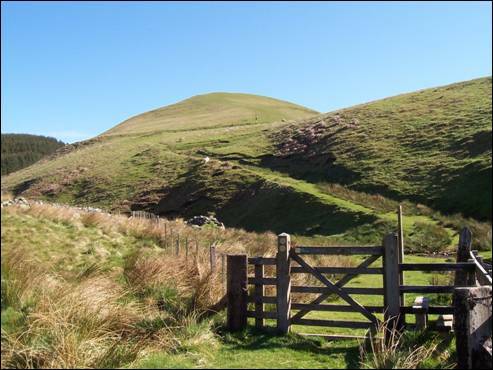 Continue across the broad ridge and down to the boggy col where you need to cross the fence, via a gate, before climbing on either of the two tracks to the 501 metre summit of Shillhope Law. This lies just west of the fence and east of a small lough. In Northumberland, the word `law` simply means `hill` and this is the first, and the highest, of the four hills named law you will encounter on this walk. 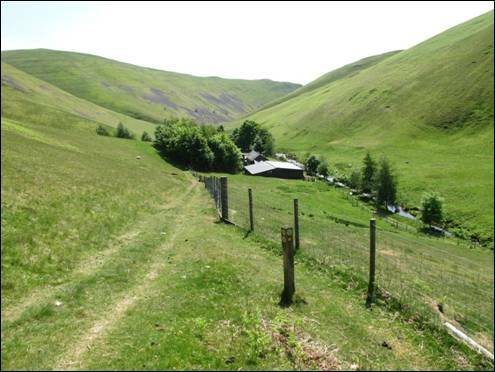 2.now head back to the fence, turn left and follow the fence as it heads downhill in a north westerly direction with superb views down to the farms of Barrowburn and Windyhaugh and beyond to the border ridge. At the gate (NT 873101) cross the fence and continue along a faint track over fairly level and then, ensuring that you bear left on a subsidiary track, head downhill towards the valley of the Barrow Burn. Eventually, you will join another, clearer track (NT 870108) which climbs up from the burn and away to your left. This is your direction of travel, in time passing through an extremely tight squeeze stile (or adjoining gate) before descending to and through the ford just in front of the building of the original Barrowburn farm. The current two storey farmhouse lies to your left just around the next corner in the track. Keep to the right of the old farmhouse and pass through the gate. At the finger post (NT 867107) take the green track which rises, to your right, up the flanks of Barrow Law, pausing occasionally to admire the splendid view of the sparkling River Coquet as it heads downstream past the impressive Shillhope Law. Keep climbing until the gradient begins, at the 370 metre contour, to ease and then (NT 867115) head west (to your left) across the pathless upper slopes of Barrow Law to the small summit cairn. Once you have caught your breath be sure to walk approximately 100 metres in a south westerly direction to enjoy the heady view straight down to the farm of Windyhaugh, once a mill for the monks of Newminster, and the bridge at Slymefoot, where in the 18th century stood a notorious public house. 3. 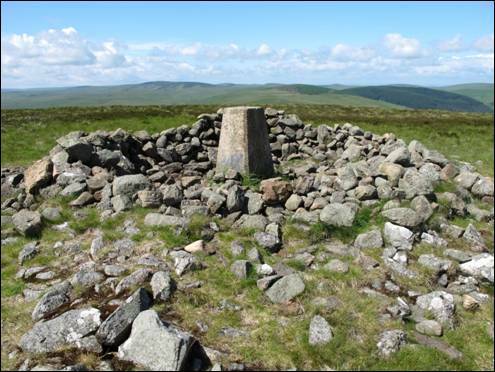 Return to the cairn and continue generally in a north easterly direction to rejoin the green track you left in order to reach the summit of Barrow Law. Take the track as it heads, over easy ground, north to Murder Cleugh with distant views to the whaleback of the Cheviot. Named after a distant and virtually forgotten treacherous act, Murder Cleugh is now engulfed in trees. `Cleugh` in these parts means a narrow cleft or gully with a watercourse and a peep into the trees will confirm that this is the case. As you approach the stile, keep your eyes wide open and you will spot, just inside the plantation edge, a small headstone bearing the words, `Murder Cleugh Here in 1610 Robert Lumsden killed Isabella Sudden`. Once over the stile (NT 868132), cross straight over the track and through the gap in the fence on the opposite side. Ignore the fingerpost and climb in a north westerly direction up the pathless southern side of Ward Law and on eventually reaching the top (NT 864136) you will, once again, enjoy excellent views of the neighbouring hills. This is a good place to break into the sandwiches. 4. 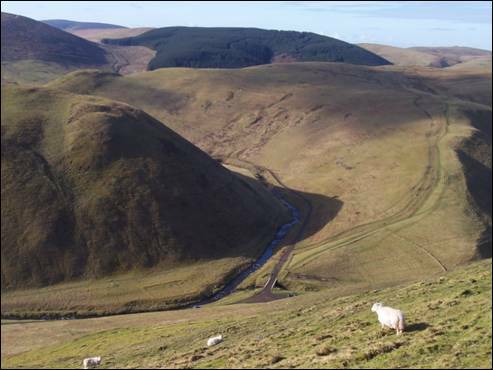 Leave Ward Law in a north easterly direction, descending gently to a green track which heads downhill from Little Ward Law and Windy Gyle beyond. Turn right and follow the track for about 400 metres before turning south east across the rough, pathless hillside, through an old and dilapidated fence line, towards the gap in the new fence running adjacent the gravel track heading north eastwards. This leads to Uswayford, one of England`s most remote farms, which during severe winters can be cut off from the rest of civilisation for long periods. During the winter of 1940/41 the farm was isolated for 17 consecutive weeks. Turn left (NT 873136) along the green track close to the forest edge, through a hairpain bend, over the Hepden Burn and then uphill until you reach the wooden multi fingered signpost. You are now at the crossroads of Clennell Street, an ancient drover`s track, which, as the signpost indicates, runs northwards from Alwinton to the border ridge, a journey of some 8 miles. Now it is time to head upwards to the summit of your final law of the day, Hazely Law. Follow the obvious end of the hill, which rises steeply to the right of the northwards route of Clennell Street, following the path to the 499 metre unmarked summit (NT 877144). Here you will be rewarded with excellent views down to Uswayford nestling below the slopes of Bloodybush Edge, Northumberland`s sixth highest hill. 5. Retrace your steps to the signpost where you will need to head due south on a fine quad track across the 399 metre top of The Middle (NT 873133) and then down to the stile leading across the forest boundary. This part of the forest is currently (as at 2016) undergoing harvesting so be aware that changes have and are still being made to what was previously a heavily treed area. Once inside the boundary, follow the deteriorating track uphill, ignoring the right hand branch, then downhill to the small footbridge, on your left, over the Usway Burn. This is a delightful place, where the burn tumbles over a series of small waterfalls, and for the rest of your journey the sound of chuckling water will never be far away. Continue over the bridge and behind the renovated building of Fairhaugh (NT 876122). Once on the stone track be sure to take the narrow path that heads to your right alongside the burn and the forest boundary fence. Continue along this path as it hugs the bank of the burn through the very narrow, steep-sided valley, which only begins to widen as you approach the peaceful farm of Batailshiel Haugh (NT 882101). The former shepherd`s house which has now been demolished and replaced with a neat detached bungalow, stands at a height of 275 metres above sea level and was referred to in the 13th century charter of Newminster Monastery as, “the shiel of Henry de Bataile” .The word `shiel` derives from the Norse meaning `summer pasture` and the word `haugh` means `flat land beside a river/burn`. The path climbs around the back of the farm, crossing en route the hurrying waters of Mid Hope, before joining the gravel road from the farm as it twists and turns down the narrow valley back to Shillmoor farmstead and the rushing River Coquet. 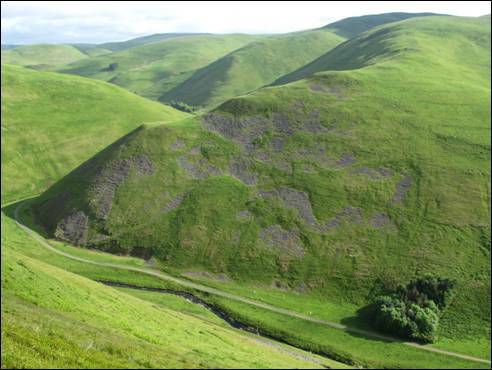 Now that you have climbed four of the Cheviot Laws it is time to get out the Ordnance Survey map and to plan to climb a few more of these fine hills. There are plenty knocking about. Steep ascents & descents, grassy paths, some pathless slopes, occasionally boggy and a stretch of gravel track.